A party hat is an essential accessory for your New Year bash. With our tips, you can make a hat for yourself and for all your party guests. 1. Roll your card stock into a conical shape and trim the bottom to make it rounded. Use staplers or glue to hold the shape intact. Cut out more hats from different colors of paper using your first hat as a pattern. 2. Cut out pretty shapes from the extra papers you got while trimming. Glue these onto the top of the hats. Apart from papers, you can also use ribbon, sequins and other decorative objects to adorn the hats. Applying glitter paint to decorate is also a great idea. 3. Print the name of each invited person in slips of paper and paste one on the back of each hat before you hand them out to your guests. New Year's Day is...what else, the first day of a new year. And a calendar for the whole year is what is required for this time as also for any time of the year. Make a new foldable calendar for your desk. 3) Colored pencils or marker pens. 1. Print out calendar pages of about 2 1/2" square dimensions. Cut these apart. 2. Cut card stock into pieces of dimensions 4 1/4" (width) by 10" (length) and fold it into a triangular shape with a flat base. Use glue to hold the triangle shape together. 3. Draw figures of your liking, cut out beautiful figures or use stickers to glue to the top of the calendar and beautify it. 4. Now glue the calander pages to the triangle shape. Your foldable calendar is ready for use. At the stroke of the midnight hour, it's time to bid goodbye to the old year and welcome the New Year with uproarious merriment. And what better way to do so than blowing the horn? 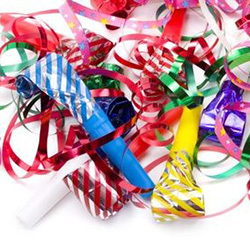 Make your own New Year Horn out of a toilet tissue roll. 1. Take your Cardboard Roll / Toilet Paper Roll and with the pencil, poke a few holes in it about 1 inch apart. 2. Cut a square shape of 4'' dimension out of the wax paper. Fasten the wax paper over one end of the cardboard roll using the rubber band. Your horn is ready. 3. Decorate the horn as per your wish. Blow it out loud exactly at twelve in the night and ring in the New Year. Note: Take care not to tighten the rubber band so much that it bends the cardboard. 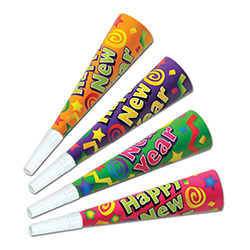 At twelve 'o clock, you should also have a noisemaker with you. So construct one out of paper plates. 1. Decorate the paper plates as you like. 2. Put one paper plate on the table and fold up its right side. Use the tape to fasten a craft stick to the rim of the plate. See that a part of the stick sticks out as a handle. 3. Turn the other paper plate upside down and put it on top of the first one. Start stapling the edges together. Leave an opening in the middle to pour in a handful of the dried beans. Then staple it shut. 4. Hold the noisemaker by the rim, and shake it! It's ready for use. Let good fortune be showered on everyone with colourful fortune bubbles at your New Years Party. 7) A basket or glass bowl. 2. Write a fortune or quote on each paper strip. 3. Roll each fortune into a small scroll and tie with curling ribbon, leaving ends of ribbon long. 4. Put one fortune inside each plastic ornament. Your fortune bubbles are ready. 5. Pile the bubbles in the basket or glass bowl. Invite each guest to pick a bubble and read his/her fortune aloud to the group. Get kids on board for New Year's Eve with these great goodie bags. Watch and learn a easy way to make New Years Mini Top Hats. This is a card tutorial video to teach you how to make a happy new year cards. This video shows you how to make a beautiful ribbon bow with 2 colours - red and white ribbon.